The chapter covers all possible cases of calculation and installation of the off-sets and risers, field-made and ordered from the shop. The chapter has 45 pictures; 23 pages*. $3.41 (Instant Access). 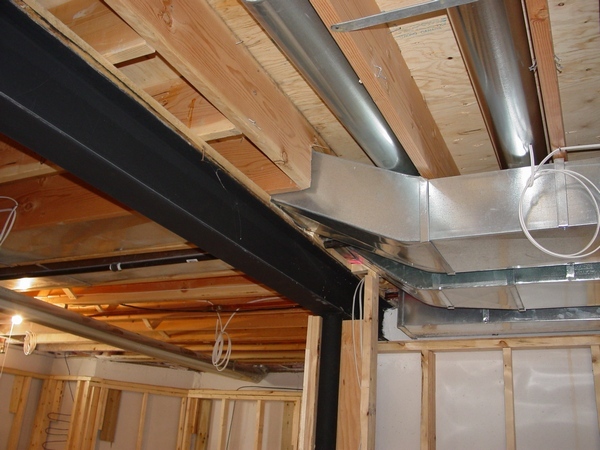 Where: M – How much you have to miter a duct. O – How much you want to off-set a duct. W – Width of the duct. L – Length of the duct. But I believe almost none of them know how to calculate M if you are dealing with the full length of a duct as you can see it in the picture. The problem here is: when you cut M from the duct it becomes shorter and it doesn’t reach to the point indicated by figure O. Sheet Metal blends basic principles with contemporary tools and technology. Now including workbook questions, this edition is concisely written, with large, two-color illustrations and updated photography to emphasize key points. On this page you can find out how to calculate an Offset and a Riser, and formulas on how to find a distance between two flat and stack (virtical) forty-fives and more! On the paid page, you can find explanations to all 15 (fifteen) topics and see 44 high quality pictures and drawings. Also you can purchase all fifteen topics separatly below. 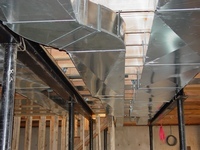 What you can see in the pictures above is the illustration of the duct length calculation. The distance between two 45*-s was larger than length of one whole duct (8'). However, it did not stop me from placing of the second 45* exactly inside of the designed spot in the drop ceiling grid! Just see for yourself how it perfectly fits 24 x 8 duct in the 24" wide drop ceiling grid! Why was this so important? Because in the space to the left there will be several 2' x 4' lights installed, but in the space to the right electricians put an electrical box (pic. on the right) and the duct can't be installed below it. All the calculation and installation was performed by me without any help from anybody else and took as twice less time in comparison to the other ways of doing the same type of calculations. This is a parent page. If you would like to read more you can buy an instant access to the secondary page. You can pay right here on this page by using the "BuyNow" button below. After you purchase a paid page, PayPal is going to bring you back to my website. In order to see the paid page you have to click on the “Register” button, fill out the form, choose your own Username and Password and click on the “Register” button at the bottom of the form – congratulation, you are now on the page you have paid for! Length of Duct Between Two Flat or Virtical 45* (30*; 60*) Working as Offset/Riser. In this tutorial for the price of only $1.86 you will learn how to use formulas without using a center line method. For the price of only $1.34 learn offset/riser calculation formula. 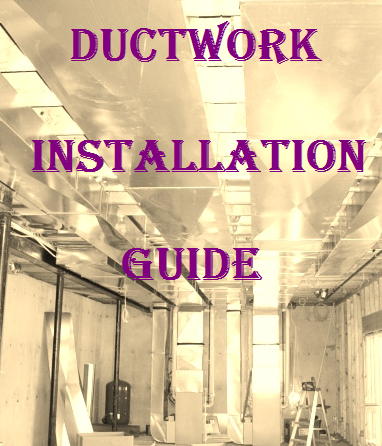 For the price of only $1.00 learn how to calculate offset/riser csituated between two existing ducts. For the price of only $1.86 learn how to calculate offset from full size duct and why the result is different if it would be made in the range of that length. 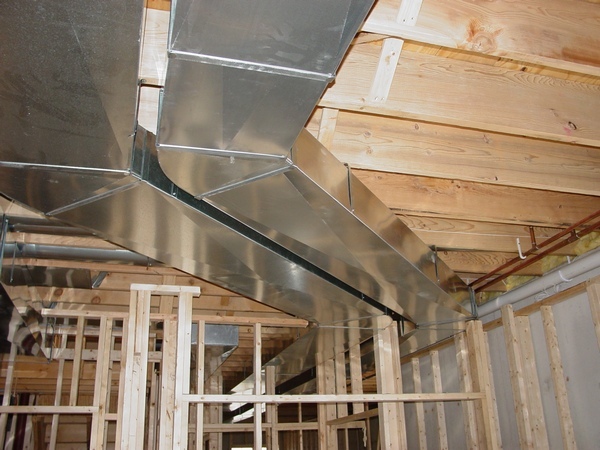 Many installers put duct together and only then miter it. This is happening because they don't know how to mark it out in the open kind. As a result the rest of the duct is wasted and if the duct made from low gauge sheet metal (24) it's become very difficult to cut through the seam, let alone, notch the corners out! For the price of only $1.86 you can learn how to do it the right way. 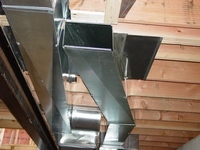 When you are hanging a straight piece of duct you always know where the hangers should be fastened and where the take-offs should be cut in. For ant type of offset it's not that obvious. If you would like to learn the answers to this problems for the price of only $1.34 you can gain an instant access to the paid page that has it all. 42. Calculation and Manufacturing Offset and Riser* – this chapter covers all possible cases of calculation and installation of the off-sets and risers, field-made and ordered from the shop. The chapter has 65 pictures; 34 pages*. $3.41 (Instant Access). On 03/19/2015 text of this chapter was significantly modified and improved. On 08/13/2015 one picture was added. Do you want to know how to make a square to round offset transition? Do you want to know how to make it in a matter of minutes? Do you like this 8”x 8” square to 6” round 4” offset transition that you can see on the left and would like to know how to make any other one? If your answers to all these questions are "yes", then please click on the Buy Now button below and for the price as low as only $3.49 purchase an instant access to the page where you can find 16 high quality photos with step-by-step instructions! "how big of hole needed fo 10 inch pipe through 45 degree angle" - well of course it wasn't a direct question, but it was a "keyword" someone was using to find my site on the web. And guess what it is there! I am about to install a woodstove. The flue goes straight up thru a cathedral ceiling that is 12:12. The pipe that penetrates the ceiling is approx. 8" diameter. Selkirk (Metalbestos) sells a woefully inadequate one-size-fits-all two-piece trim kit that does not provide a tight fit... how could it, when it supposedly "fits" anywhere from 6:12 to 12:12? Anyway, my question is about laying out the correct cutout given the OD of the pipe and the 45 degree angle of the lid. If I can make the layout on paper I can get my friendly local tin man to make a decent looking piece of out heavy galvanized sheet. An alternative is to send it to the friendly non-local tin men who have a CNC cutout machine, it would take them just a few seconds. But I'd rather do it. How do-able is this?" So, if you'd find this thread on that website you'd actually learn how this question was answered, but here is another question - would you understand the answers? I'm sorry but even with my master degree in the mechanical engineering I didn't. Furthermore, would an ordinary tin knocker with pretty much forgotten high school diploma ever understand it - sorry guys, but I do not think so! If you would like to read more please click on the Buy Now button below. On this page for the price of only $2.50 you can learn how to make a 10" x 8" radius elbow by using only hand-tools. This tutorial has 30 high quality pictures with brief explanations. 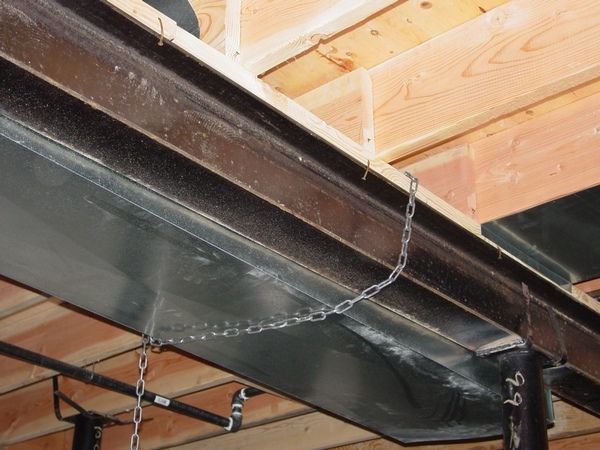 For the residential applications risers usually used in the cases when you need to bring duct up in the joist space, get it down from the joist cavity or rise it after it passed an I-beam. In the first two cases the rise itself for the 10" (12", 14") x 8" duct could be 8" - 9", in the third one usually it starts from 9 ½" - height of an I-beam plus a bottom board. If an I-beam is taller then the riser should be taller as well. So, if you would like to learn how to make a 12" x 8" riser with a 9 ½" rise by using only hand-tools, please hit the Buy Now button below. Then, for the price of only $2.50 you will gain an instant access to the unique page with 38 high quality photos on it set in the step-by-step sequence with brief explanations. 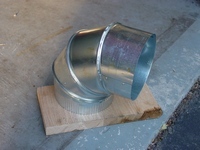 I already have this kind of tutorial for a piece of duct. You can find it on the paid page above. But if you need a real thing something like shop-made offset or riser you might be interested in this tutorial. The fitting that you see on the left is 12" x 8" "rolling" offset, and it changes direction horizontally for 6" (offset) and vertically for 5" (riser), and it's 18" in length. You can't find online a tutorial for these kind of fittings - because I already tried and there is nothing for the ducts (just for the pipes), and they won't teach you at the sheet metal shop - because you can't use a Pittsburg lock machine for this fitting's Pittsburg seam! That's why these kind of fittings you can make only with the hand tools. The price for this tutorial is only $3.50. On the page you'll see 36 high quality pictures set in the step-by-step sequence with explanations. Nobody in the big operations companies making any radius fittings anymore! All the fittings such as elbows, offsets, risers, cold air boots and so on made with square throats. This way it's a bit easier and faster to produce and assemble and in this tutorial for the price of only $2.50 you will learn how to do it. So from now on you are able not only learn how to figure out the length of the duct between to 45 degree elbows but make those elbows yourself on the job-site or at home! On the page you'll see 37 high quality pictures set in the step-by-step sequence with explanations. Usually I keep a cold air return duct 4” away from the I-beam. In the case that you can see in the pictures above I didn’t have a 20” x 8” to 10” x 8” transition at all and even if I would, it wouldn’t be made as a 1” offset I was needed for this job. So I made it from a piece of duct! If you need more info with step-by-step instructions on how to make a 20” x 8” to 10” x 8” transition with 1” offset for the price of only $2.50 you can gain an instant access to the tutorial that includes 35 high quality pictures with brief explanations to them. 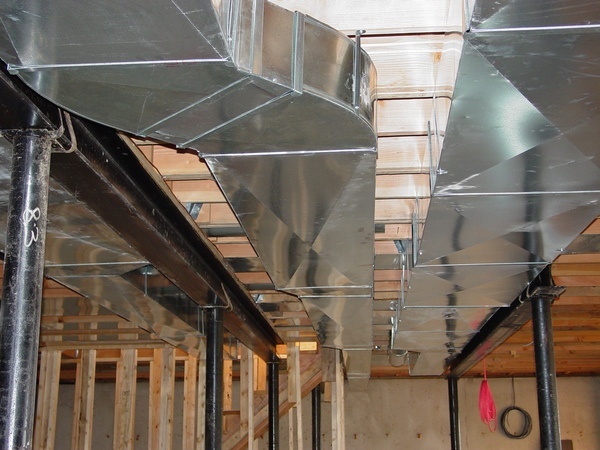 What is the formula for a 45 degree offset in ductboard? What is the formula to miter a piece of duct? What kind of calculator can I use to figure out the offset between two 45 elbow on round spiral pipe? I have been buying how to books for the last 40 years. Richard S. Budzik book, "Today's 40 Most Frequently-Used Fittings" is the best book on fabricating sheet metal fittings that I have found. May I suggest that this is the best how to book on any subject ever. This is great book in the Industrial Arts tradition. I am now using this book for sheet metal class instruction at the TechShop in Menlo Park, Ca. Use this book as a handy reference or as a textbook to learn all the methods you may need.